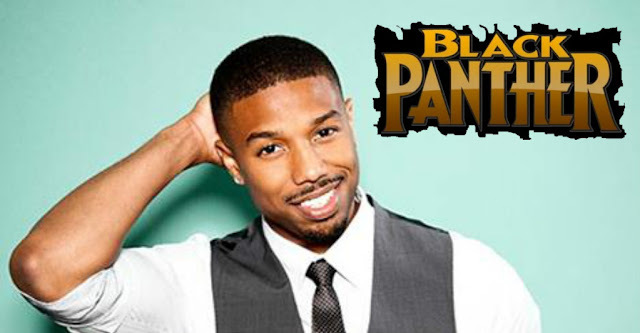 If you're Ryan Coogler, acclaimed writer-director of 'Fruitvale Station' and 'Creed,' and your next project is putting together the highly anticipated Marvel movie 'Black Panther' it's only natural to acquire the hottest and most talented cast possible. As if having Chadwick Boseman as the titular warrior king of Wakanda T'Challa and possibly Lupita Nyong'o as the love interest wasn't enough, Michael B. Jordan has been added as a possible villain. Jordan teams up with Coogler for the third time as The Hollywood Reporter first reported his casting. Coogler is writing and directing the 2018 Marvel feature that stars Boseman as the Black Panther. The character was just introduced to the MCU in the blockbuster Captain America: Civil War where Boseman stole every scene he was in making him a regal but fearless Avenger. He was a formidable hero laying waste to the Winter Soldier throughout the film. Like Chris Evans before him, Jordan shakes off an unsuccessful turn as Fantastic Four's Johnny Blaze/The Human Torch to be redeemed in a Marvel Studios film. Details of his role haven't been revealed but THR's sources claim it's for a villainous role. If negotiations with Nyong'o pan out, 'Black Panther' could have an impressive line-up in front and behind the camera of today's brightest and most revered young black talent. Oscar-winner Nyong'o has appeared in two huge blockbusters for Disney - Star Wars: The Force Awakens and The Jungle Book - and now stands to be in another one. Boseman's stellar performance in the $700 million-grossing and counting 'Civil War' has generated a great amount of buzz for 'Black Panther.' Coogler is one of the most sought-after filmmakers in Hollywood who's earned creative control over his projects because he's invested as both writer and director. Marvel had the good sense to go after him aggressively to put his mark on one of the most underused but admired comic book properties in their catalog. Jordan's star has risen in recent years but his body of work from 'The Wire' to 'Friday Night Lights' to 'Fruitvale Station' has earned him many accolades and a spot on Hollywood's A-list. He is currently developing a remake of The Thomas Crowne Affair as star and will also produce along with 'Civil War's directors Joe and Anthony Russo. Black Panther is scheduled for release on February 16, 2018, with production set to start in early 2017.